One of my friends, Barbara Bird, suffered a heart attack last summer. She is the first friend of mine to experience this. As women, we don't experience the same symptoms as men and women are more likely than men to die in hospitals from a severe heart attack. We're grateful she survived and she told mer her story in person when she visited me in October in Santa Fe. Now she is telling her story as part of a GoRed American Heart Association program in Tulsa, Oklahoma, and you can hear her story and also vote for her to be chosen to make her story impact a wider audience and help the cause of advocating for awareness on this issue. With heart disease the number one cause of death, she would be a good spokesperson for heart health. She's in a tie and I'd like to help her win. Please, vote for Barbara and listen to her story. Here's the link. Scroll down. Thanks! Update I-- thanks for all your emails, too, to let me know you've supported her. Update II - 2/16 -The contest is over and Barbarba placed second. Over 18,000 votes were cast, which means a lot of women were educated through this promotional/educational campaign by he American Heart Association. This is a great example of interactive advertising/media promotions. Friends, good friends, know what we love. They know what excites us, what makes us who we are. Good friends will want to know these things and celebrate the life and joy that comes with our uniqueness. When taking friendships deeper, when getting to know others -- really know them -- you look at what makes up a person. Facts, details, history, circumstances, who they run with, who they love, what they care about, what they think of things, where they've been, where they are, where they want to be, what makes them laugh, what makes them cry. When you know others in this way, you live in the gold joy found in the bonds of friendship and you know that you are rich in your friends. So with the economy being what it is, let us hearken with the opportunity to remember that gifts of the heart, sharing time and talents and giving the gifit of the self, not gifts from the pocketbook, might be the best kind of gifts that there are. With that, I give you the gift from my friend, S. in Santa Fe, who knows that the first snow on the aspens-just-turned-gold adds yet another color when held in the green of the pines in our mountains in Santa Fe. We share a love of photography and of the place where we find ourselves. Knowing I'm not there to see it and knowing how I love the mountains, she sends this to me and I share it with you. None of this costs a dime (except her gas up the mountain). Seeing this makes me happy with the view, reminds me of the love of that place, and happy with my friendship. Friends in Houston report that their homes are still without power. I met one for coffee last Sunday in Salida, Colorado. While the market news keeps us fixated on the now of things, holy cow -- things are really tough in the city named for Sam. Homes are gone on Bolivar Peninsula and owners can't even get there, or send insurance agents to take a look-see. At least I can send email (my god daughter checks in from the hotel) and call by cell phone (my girlfriends somehow are keeping their cells charged). Meanwhile, back at the ranch, a new U.S. Census Bureau survey confirmed what many in North Texas may already have suspected: Plano has the highest median household income, $84,492, of any community with a population of at least 250,000. That is much higher than the average for Texas, $47,528, or the U.S., $50,740. Maybe the former Lehman Brothers COO can sell his $32 million Hamptons house and move to Texas. 800 children from the Houston area were scheduled to start school in Fort Worth. What a mess. I fell asleep in college to his tunes; the album belonged to my roommate, B. It was Cat Stevens or Boz Scaggs most nights. They say you can't go home again, but what if home is a moving target and friends sprinkle every place? How do you keep those threads? How do you keep those friends? As a mom, as a woman, friends are most precious. Thanks to one of my dearest friends, a fun simple wine and cheese let me stay in touch with Houston friends. All it took was an idea and an email and an afternoon putting it together, together. I appreciate all of my girlfriends who took the time to come. They all have an open invitation to come see me in NM! Friends echo ourselves. We are mirrors for our friends. What defines us most? A place? A passion? Friends? Family? Talents? Accomplishments? Circumstances? Shared time? Special moments? Memories? My parents were with me as I watched my childhood best friend walk down the aisle last May. She was 50 and, as the mother-of-the bride, she was beautiful. We wore the same uniform in gradeschool. We had the same hair cut in middle school. We married our college sweethearts, who were fraternity brothers. We were pregnant at the same time and she had her first child, a girl, three months before I had mine. Her baby girl walked down the aisle three months before mine will. I had a huge lump in my throat the whole time. Her daughter was so stunning. How could that little darling baby now be a stunning bride. My friend, yet again, will tell me how it will go. I'm so glad she will be here. 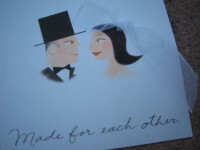 I'm in full wedding mode, loving all these ties that bind, friendship, familial and matrimonial. I do, I will, I woo, I dill. Prince Charles: Ahead of His Time? He met his love ahead of his wife. He was into organic before the rest of us were. Maybe the King-to-Be is just one of those who operates ahead of things - even himself, the Prince of Quixotic Timing. Prince Charles marches to a different drummer and perhaps when the Queen sings her last, he'll have a wee bit of time to wield his influence. His thoughts on organic farming were way ahead of his time and his idea that 70s/80s architecture was a carbuncle on the face of London was spot on. Prince Charles created Duchy Originals in 1990 in his effort to promote the advantages of organic farming through the production of natural and healthy foods and sound husbandry which helps to regenerate and protect the countryside. The land he owns in Gloucestershire, near his Highgrove country home is his place to farm organically. His Duchy Originals Oaten Bisquits and Gingered Bisquits came out in 1992 and they were sold in outlets like Harrods, Selfridge's, Fortnum & Mason as well as smaller outlets throughout Britain. 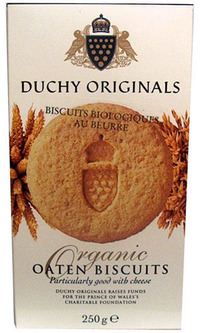 My favorite: Organic Lemon Biscuits. You can buy them through The British Shoppe, based in the U.S. He might have tried to be inspiring in 1980 when he shared that he talked to vegetables, but his use of heirloom seeds and his approach to agriculture are worth respecting. Regardless, I like the fact that we call them cookies here, thanks to the Dutch word winning out over the British term in Manhattan. The public relations effort is on to prepare the public for the Prince to be King. Some stuff is fluff. Some is stuff to notice and chew on. 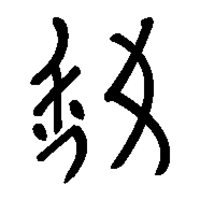 Nu shu is a secret language used by Chinese women. Lisa See, who is part Chinese and grew up in L.A.'s Chinatown, has written about it online and in her book, Snow Flower and The Secret Fan. My mother gave it to me for my birthday and I will pass it on to a young woman from Texas who is in love with a Chinese man. It is a novel mostly about female friendships in rural China when emperors ruled and when females held no value. They still don't, which is the reason so many girls are available for adoption in China, especially with the one-child policy. Female friendships were the cultural salvation that made living palatable for many of these women. Girlfriends, Are We Wierd or What??? My blog friend Claude in Paris has become a memer for the first time. I, too, have never done a meme thing. She didn't tag me but she did put the idea of this I am wierd meme in my head so my fingers itched to write about weirdness. 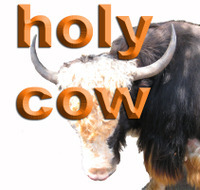 She wrote about her personal weirdness on her blog yesterday. She is the most unbelievable talented photographer and posts her photos on her photo blog - another blog she runs - where she captures photos on her daily walks in Paris. Claude thinks she is weird because she has posted some 13,500 photos on Flickr. I don't think she is weird. I think she is unbelievably talented and is an inspiration for following our passions. So here is my meme thing and I challenge you to do it too. I think you are supposed to tag people like "you're it" but I'll forgo that. I like broccoli and enjoy decorating food with edible flowers and I'll eat dandelion greens as long as they are organic and not toxified with pesticides. That is the goat in me! I can not tell a joke. I forget the punch lines or ruin it by getting it wrong in the delivery. I also am slow in "getting" jokes. However, I do get silly giggly sometimes, especially with my husband and my oldest daughter and sometimes my mother. It is terrible to have this happen in church. Moving is not easy for me, nor is being a "corporate wife," and I feel somewhat alone in this and probably gripe and blame way too much and grieve for the friends and family I leave behind. I get my syntax mixed up, sort of like Bush does. My Dad does, too, so it must be a genetic weirdness. It happens with numbers, too - sort of dyslexic. I'm so not a math person because it requires detailed logical thinking. I have a habit of humming when I exercise -- from my years of being on the swim team. I can't stand Barbie dolls or Cabbage Patch dolls. I do love love love babies to the extreme. I had to go work/volunteer with needy little ones to satisfy my mother urges. OK. Enough of memes. Am I the only weird one?